A ferry comes to port. At the same time, a mutilated human corpse is found in the ocean. Passengers on board the ferry are prevented from going ashore, because police inspector Andri suspects the murderer is on board. 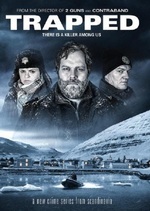 He starts investigations, but meets severe resistance, both from the uncooperative ferry captain, and a really bad snow blizzard, which threatens to isolate both the ferry and the village. Guardian: "It has all the tropes you would cross your mittened fingers for from a Nordic noir. There are bleak skies and brooding landscapes; a head-scratchingly unusual murder; a charismatic, if troubled, lead detective, and a storyline with more (pickled) red herrings than you could shake a loaf of rye bread at. Plus woollens! So many woollens." New York Times: "Whatever your winter is like, Andri’s is probably worse." Hollywood Reporter: "Judged on this persuasive opening pitch, Trapped feels like a keeper, superior small-screen comfort food for the dark winter nights ahead." And it's been picked up for a second season! This is a great show, and not just for the location. The plot is evenly paced, the characters three dimensional, and the plot twists not easily predicted. That storm, it's relentless. I loved this series.